Displaysense I BlogPackagingWhat are retailers doing to reduce plastic waste? As plastic waste is branded “one of the greatest environmental challenges facing the world” by Theresa May, the war on plastic is in full swing. The latest plan proposed to reduce plastic waste is to ban the sale of plastic straws, drink stirrers and cotton buds. But is this enough to tackle the bigger problem? The World Economic Forum has estimated at least 8 million tonnes of plastic waste ends up in the ocean every year. If we carry on at a rate like this, there will be more plastic than fish in the ocean by 2050; not to mention the amount of plastic being ingested by fish and other sea creatures (it is estimated that one in three sea turtles have eaten plastic) – this in turn could re-enter the human food chain as traces of plastic are being found in seafood, salt and beer. The Center for Biological Diversity found that fish in the North Pacific are known to ingest up to 24,000 tons of plastic every year. And there is now a growing concern about the presence of micro plastics in tap water – a recent test showed that 94% of US tap water contained plastic fibres. With so many single use plastic products that make our lives easier, have you ever stopped to think what happens to plastic once you’re done with it? 50% of plastic products are used once and then thrown away. A plastic straw is probably only used for as long as 20 minutes before it’s discarded, it will then take 200 years to biodegrade. A plastic bottle will take 450 years to biodegrade, with an estimated million bottles sold per minute, it’s hard to imagine a world that’s not overwhelmed with plastic bottle waste. In the final episode of Blue Planet II, Sir David Attenborough urges that “we must act now to protect our oceans from the deadly threat of plastic” as viewers are shocked by the heart rending scenes of animals exposed to the effects of plastic pollution. The BBC documentary has encouraged consumers to think more about the kind of products they buy and how much they recycle. A survey conducted by Ecover found that one in five people switched to using reusable shopping bags after watching Blue Planet II and seeing the devastating effects of plastic waste in our oceans. A petition by Greenpeace has been signed by more than 436,960 people to date, calling on supermarkets to dramatically reduce the amount of plastic waste they produce; UK supermarkets currently generate 800,000 tonnes of plastic packaging every year. A number of British retailers recognise their corporate social responsibility when it comes to plastic waste and recycling, but what are they doing to reduce their plastic footprint? Iceland became the first major UK retailer to commit to eliminating plastic packaging for all own-brand products, pledging to go plastic-free by 2023. Supported by their own research that 80% of consumers would be in favour of a supermarket that decided to go plastic-free. Sainsbury’s have already introduced fully biodegradable cotton buds to their own brand range by replacing the plastic stem with an environmentally friendly paper stem, this has resulted in a 55 tonne reduction in plastic production. They have also saved on 580 tonnes of plastic just by redesigning their two-pint milk bottles. Tesco have committed to making all packaging fully recyclable or compostable by 2025. By reducing the plastic in their meat trays, 96 tonnes of plastic have been removed from the manufacturing process and the new, lighter packaging is also easier to recycle. Low cost competitor Aldi have recycled 100% of cardboard and plastic since 2014, with none of the waste produced sent directly to landfill. Asda has promised to scrap 5p carrier bags in all stores by the end of 2018, switch all plastic straws used in its cafes to paper and introduce reusable drinks cups in its shops and cafes by the end of 2019. Coca-cola has the goal of recycling 100% of its packaging by 2030 with their new sustainability strategy ‘World without Waste’ as well as a commitment to use 50% recycled content in their bottles; CEO of the soft drinks giant has said “The world has a packaging problem – and, like all companies, we have a responsibility to help solve it”. Coca-cola contributed to nearly a quarter of plastic bottles sold in 2016. 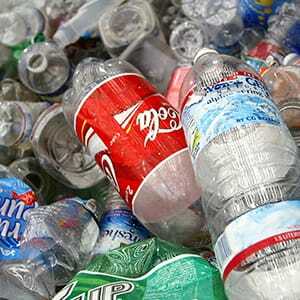 Other big brands such as McDonald’s and Evian have promised to make their packaging 100% recyclable. Plastic is strong, durable and designed to last a very long time, one of the many reasons it’s such a convenient entity in the world today. According to recent EPA studies, plasticizers are 10,000 to 1,000,000 times higher in our bodies than any other toxins, and they can cause great damage. If we carry on at the rate we’re going, not only are we damaging the environment and wild life in it, we are putting our own lives at risk. New innovations are being developed every day across all industries, with the scientific community at the forefront in advances. 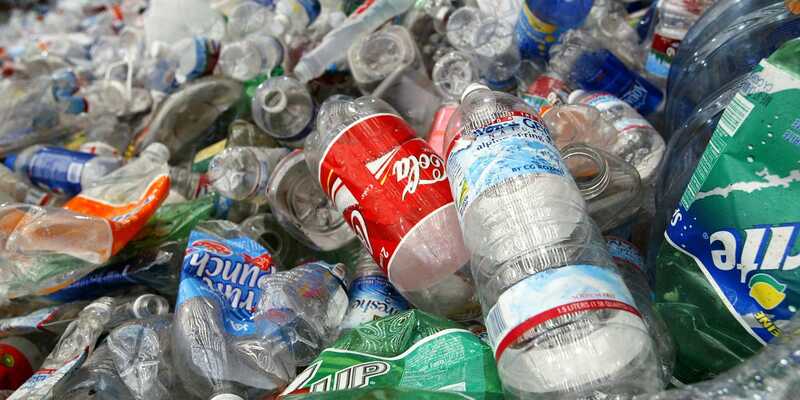 The latest research could change plastic recycling as we know it with the development of a plastic eating enzyme that feeds off PET – one of the most commonly found plastics. Eco fashion designers, Vin and Omi, have developed a range of rPET textiles made from plastic waste that has been primarily sourced from rivers and the ocean. The clothing produced by the pioneering designers is surprisingly softer than normal cotton, this is just one of the 12 ‘eco-textiles’ that the pair have developed. So what can you do to reduce plastic waste? There are many ways you can contribute to the war on plastic waste on a day to day basis and without the support of consumers, the long term solution will become a distant dream and we’ll be drowning in plastic before we know it. Think about the impact of your own plastic footprint; could you start to use a reusable drinking bottle, say no to a straw at the bar or do you find yourself forgetting your own shopping bags for your weekly shop? Reduce the need for recycling by reusing or avoiding plastic all together. With the recent UK Plastic Pact, 42 companies have pledged to reduce their plastic pollution by 2025, but is this enough to reduce plastic use overall? The Environment Secretary, Michael Gove, said “Our ambition to eliminate avoidable plastic waste will only be realised if government, businesses and the public work together” further enforcing the need for everyone to work together if we want to see change. Little actions can lead to big change in the future – with consumers demanding change, retailers now feel obliged to reduce their plastic footprint. The big question is, is this plastic pact ambitious enough?